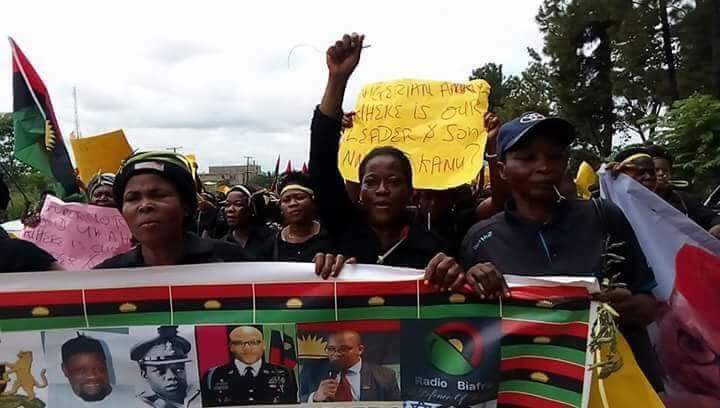 The brute-force attack strategy employed by the Nigerian government in handling issues against pro-Biafra activists is like a man creating a monster that will one day turn around and devour him. And the high handedness with which they follow the Biafra agitators is a proof that Nigeria doesn't value history for you cannot beat a child and forbid him not to cry! On September 14, 2017, the Gen. Tukur Buratai led Nigeria Army under the order of Muhammadu Buhari in collaboration with Ohanaeze Ndigbo and South East Governors, invaded the home of the leader of the Indigenous People of Biafra (IPOB) in a failed assassination attempt which resulted the death of 28 members of the group, and the disappearance of Mazi Nnamdi Kanu and his parents. 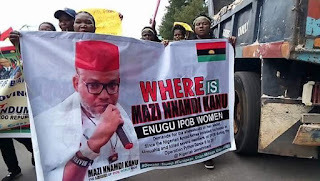 For the past one year now the whereabouts of the Biafra leader and his parents is still yet unknown, millions of his followers have been keeping their cool until on Friday, August 17, 2018, when their women decided to embark on a peaceful protest in demand of Kanu's whereabouts, and again, the oppressive Nigerian state as usual called out their armed Police officers to shoot at them with live bullets, harassing and arrested as many as they can after saturating them with lachrymator agent causing them severe eye and respiratory pain. As at the time of filing this report 48 IPOB women are still been held in an inhuman condition in Owerri, Imo State under the watch of Governor Rochas Okorocha and the state's commissioner of police, Dasuki Galandanchi. It is obvious that the Nigerian state has continued to try the patience of this non-violent agitators for quite a long time. And there comes a day when you are being pushed against a brick wall, the seemingly only option for you is to either get through the wall or get over it! And every right-thinking person would know that such a day is here upon us! 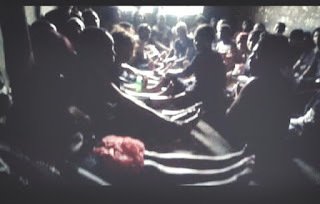 The world and the international community can bear witness to the fact that the Indigenous People of Biafra (IPOB) has been victimized by the Nigerian state in so many occasions whenever they carried out a peaceful protest against the marginalization and unlawful detention of their members yet, they remained peaceful and resolute in their pursuit for self-determination but the oppressive Nigerian state has continued to kill and maim them for no just course which appears that the only language they understood is violence, which may result to arm struggle. 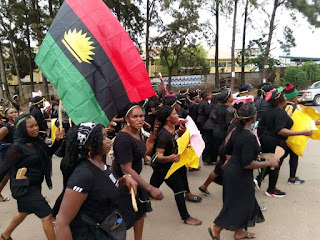 And we hope that no one should blame the Indigenous People of Biafra if eventually they resort to arm struggle since they are being killed every day for exercising their rights just like every other free people of the world has exercise theirs. The brute-force attack method being used against the unarmed pro-Biafra agitators in southeast Nigeria is the same approach that birthed the dreaded Boko Haram terrorists in the northern Nigeria which has gone beyond the scope and strength of the federal government and the international community as well. Recall that the movement once began with a group of people lead by one Muhammad Yusuf who holds peaceful rallies and talks going from one mosque to another teaching the Muslim faithful sharia law and they were conducting themselves peacefully while doing that. But all came crashing down when the Nigerian government under the watch of the former President Olusegun Obasanjo began to treat them with contempt, shooting and killing them at random just as they have been going about the case with IPOB. It was then that the once peaceful Jama'at Ahli as-Sunnah Lid-Da'wah wal-Jihad group turned violent and started carrying guns, IEDs and all sort of dangerous weapons and started bombing and killing people before they were tagged a terrorist organization and ever since then Boko Haram has not stopped killing people in Nigeria. A word they say is enough for the wise. The Nigerian government must learn from history or risk having another insurgent in addition to the one they created by themselves which they could not contain. This is because when injustice becomes a law, resistance becomes a duty.